I love the thick wool felt that's increasingly popular, but man. Wool felt in the 3mm to 5mm range is really expensive ($130/yard or so). The boxes, bowls, and vessels made with it are very cool, though. So when I was poking around my local craft store, I found a poor girl's substitute: Eazy Felt. You know it's cheap when "easy" is spelled with a Z instead of an S on the product label. It's regular craft felt that's been stiffened into sturdy sheets, and cost me $1.78 per 12"x18" sheet. 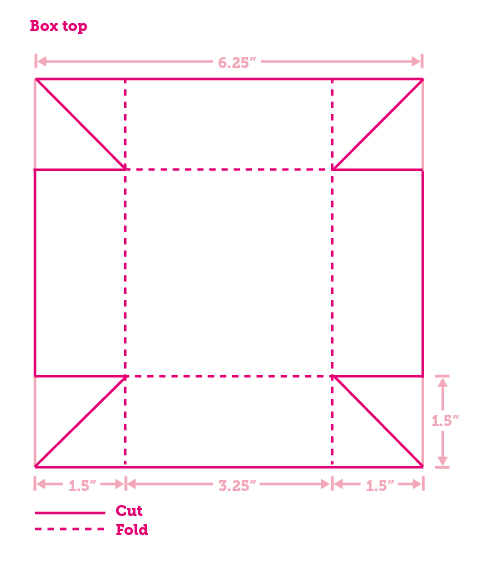 I used a rotary cutter and ruler to cut out the main shape, then made the slits and diagonal cuts with an X-acto knife. The stiffened felt cuts quite eazily. I didn't trace a pattern onto the felt; just measured with a ruler, marked the points, and sliced. The box top is similar, except the center area is larger to fit over the box bottom, and the sides are half the height. See the template here. 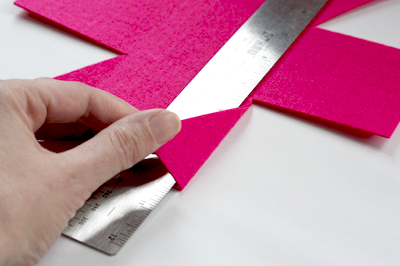 After the pieces are cut, crease the tabs against the edge of a ruler to make assembly easier. 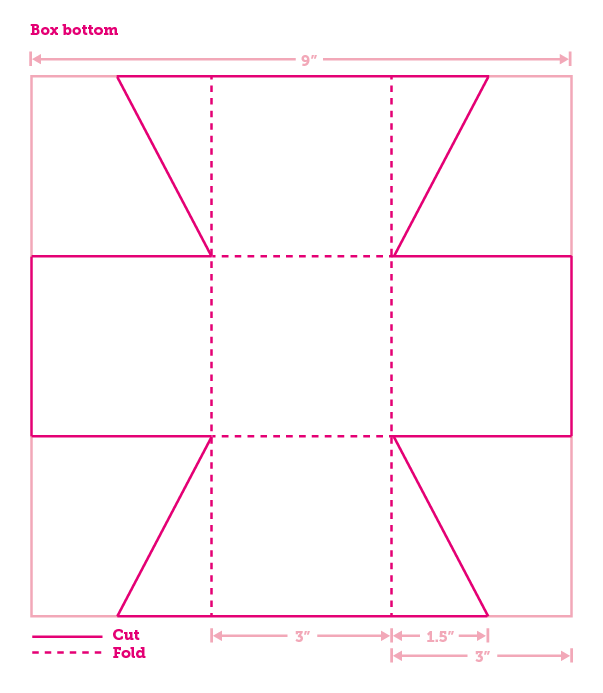 Fold the triangular tabs inward and bring the sides of the box up. 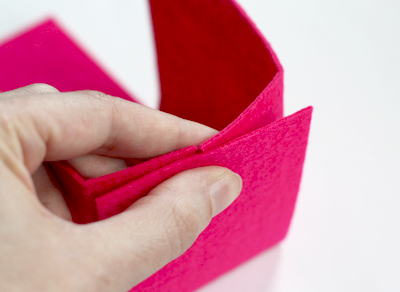 (To allow for the thickness of the felt, you may need to trim an eighth inch off the edge of the triangle tabs so they don't poke out past the sides of the box.) Then secure the flaps with a hot glue gun. Do the same for the box lid. All done! I love this idea! I already have some regular felt on hand, do you have any suggestions for "stiffening" felt on your own? Starch maybe, like ironing clothes? Thanks! Rad! I didn't know felt came stiffened like that. Oh, the possibilities. These boxes are great. Amanda, maybe try this or this for stiffeners. Or spray starch. 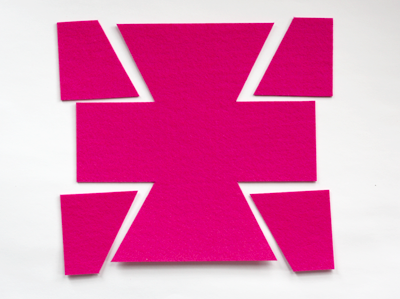 Or try mixing Elmer's glue and water, brushing your felt with the mixture on both sides, and then letting it dry. I've heard of people doing that. very cute. I think I even have some felt left from another project. perfect! Helena, I just added a photo to the post to show what's currently in mine! Ooo, you could put coordinating quilting fabric on the sticky side. These look yummy! Great idea, thanks for sharing. Might make a nesting set for son's room. Beautiful blog!! I think I'll be your next follower!! Ciao, Francesca, an Italian blogger. Cute.... these boxes are great for keeping small treasure gifts. Great make! - you could also stitch the joins after gluing using an over-stitch or blanket stitch. And maybe add a large button to the lid to serve as a handle. Thanks for the post,I learn new stuff here and that is to create boxes.Your blogs are really helpful for those who explore something new out of their creativity. Filed in my Christmas present bookmark folder, so if I don't get around to trying this soon, it will give me a reminder later in the year to try some boxes (yes with cheap felt!) to package cat treats in for presents this year! Absolutely love this bright and simple idea. LOVE the colors. Very cute! Perfect for little treasures. Thanks for the great post! Those are beautiful. You can get thick felt for cheap from felting thrift store wool sweaters. I've made some small bags from this material that came out pretty well. The knitted fabric doesn't make for quite as smooth of a felt though. What are the dimensions of the finished box? Those little boxes are really unique!! I may have to go look for some cheap felt and try some out. These would make the perfect gift boxes! Loving this tutorial! Thank you so much! I've been reading your blog for aaaaaaages and I wondered whether you had any time to take a peek at my website. I'd really value any feedback you have. I'm kind of new to this blogging/shop thing, and am looking for all the guidance I can muster! Thanks for your great posts - it's so great to have crafters who are willing to share their ideas, and you always do it so well! Kim, they're about 3 1/4" square. But you can scale the measurements up, of course. Ivylou, will do! And you might check out this book when it comes out. Made three tonight and am going to make thirteen more to use for party favors. Thanks for the great tutorial. I have one question--how do you get the edges to hold a crisp crease? What a brilliant idea! 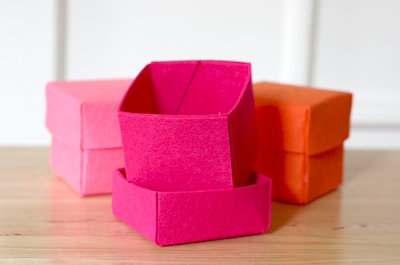 Beautiful felt boxes.Thanks for inspiring. Okay - so that is AWESOME - can't wait to try this ... it's raining, Maybe today!!! Thank you for the inspiration! Love the boxes . . . 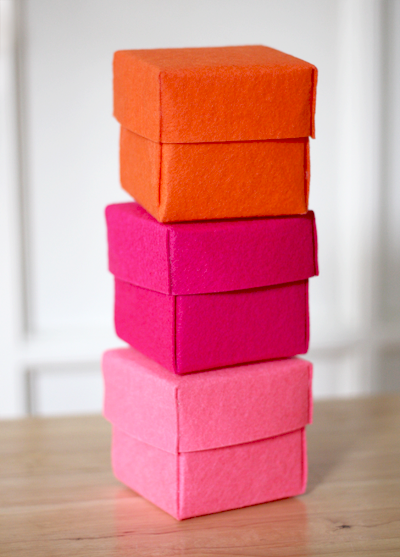 I am a teacher and I am going to make these - good things come in small boxes! These are so gorgeous & clever. I made a card base with stiffened felt once but never thought of a box. You're the best. Thanks! I really love them ! Thank's for the DIY....It's so cute ! Have a Goog day. Aww the cuteness! I love them! I sometimes make my own felt by buying woolen jumpers from the op-shop and putting them in the washing machine on hot cycle...it can be hard to find the right kind of jumper though because it has to be 100% pure animal wool! Thank you for sharing this adorable idea! Cant remember if I left a comment... I've pinned this project a couple of days ago. I Just added your blog to my blogroll so I look forward to seeing all your fab ideas. I have printed out the template at least a dozen times in a dozen different sizes ... and every time I try to do it in felt (then I moved to paper because my experiments were getting expensive) the top is Waaay bigger than the bottom. Any suggestions on how to make them fit as well as the ones in the photo?? Love the idea, but the execution leaves a lot to be desired. Hi Marie, so sorry; I should have clarified that the pattern is just a visual to show where to measure and mark the points on the felt before cutting and folding. (Rather than printing it out and pinning it to the felt like a sewing pattern). I just measured with a ruler and marked the points on the felt with a tiny pen dot, then cut. 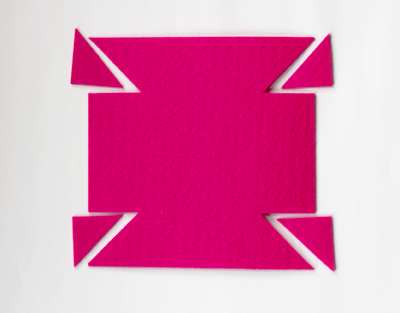 Or if you have a cutting mat with a grid on it, you might not even need to mark the felt. Jessica -- That TOTALLY helps! LOL! Oh my goodness. I should have read the instructions better, but I was in such a rush to make them! They are absolutely adorable and I can't wait to try again! Thanks for the help!!! Love your blog!! These boxes are adorable! Need to get some of that felt. Thanks so much for sharing. this is gorgeous stuff! thanks so much for the tute! going to go hunt me some felt squares! Love the cute boxes. Just bought some felt the other day. I think I will give it a try. It's a fabulous and economic idea! I made a link to your blog in my article today. Tell me what do you think about. These are so cute! Would be great for gift card holders! I love these boxes, I love boxes. I've always made them using paper but, the felt is gorgeous. I use felt a lot (the cheap stuff) and in some cases I need stiff felt. What I do is either bond two felt sheets together with Wonder Under, Stitch Witchery or Heat N Bond. Another way to stiffen is to bond cotton fabric on one side, use that side for inside the box. Does the ironing method work with cheap craft felt, or just wool felt? To clarify, I meant the relatively less-expensive wool felt, not the thick, super duper expensive kind. The methods I discribed is for the cheap poly felt, not wool felt. I only use the expensive stuff if a customer makes a request. A lot of my felt work is for children crafts. P.S. I did forget to mention, use a pressing cloth over the felt when ironing. The pressing cloth makes sense. Thanks! Ah! You're my hero! Will make asap for all my tidbits! These look great, very cute! Very nice idea! I recently came across this pin on pinterest. 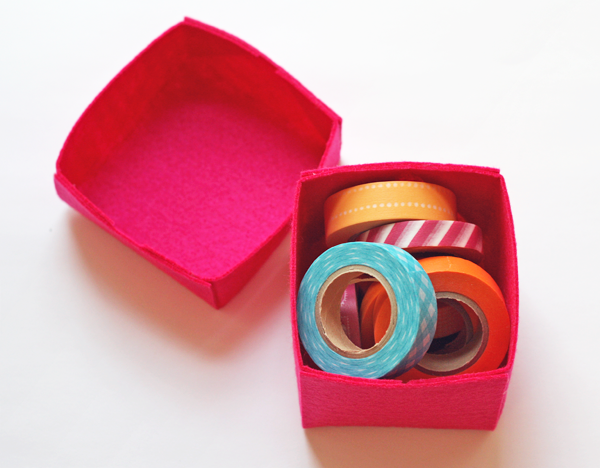 Now on I am making my own small gift boxes. A A4 size stiff felt is a dollar at Michael's. Thanks a lot for your DIY. I just love your idea and it's so easy to do. Thanks. muito obrigada. rio branco, acre, amazônia, brasil! wow this is exactly what i was looking for! thank you!